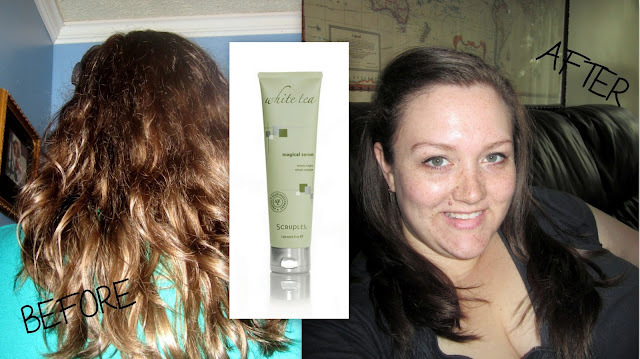 Today I am reviewing Scruples White Tea Magical Serum on my naturally crazy hair! The before photo looks lighter because of the flash, I had to take it myself LOL. My hair has always had a very random curl/wave to it and a lot of the time it looks like a frizz-ball mess. I've tried so many products to tame the frizz that I've lost count. Most products simply can't tame my craziness. After having three children my hormones seemed to change and my body decided that my hair wasn't annoying enough. Now I have even frizzier hair that has a mind of its own. Most days I am happy just to put it back in a bun or braid, just so it isn't in my face. I really wasn't expecting much from this Scruples product that I reviewed. I've been burned so many times by other products claiming to tame the mane. First off, the smell is amazing! It's a lovely floral citrus scent that is nice and light. This product has not been tested on animals and it contains NO animal ingredients. You can use the magical serum with your heat styling tools because it protects every strand. I put a quarter size dollop in the palm of my hand and then ran it through my damp hair. I sectioned my hair off with a few banana clips and then used my blow dryer beginning at the roots, slowly working my way out to the tips. My brush of choice is a 2" vented. Once I had my hair mostly dry I switched to my flat iron. The one I use is a very cheap one, it gets the job done but it's not the greatest. I sectioned my hair off again and then straighten each 1" section then twist the ends to give it a small curl near the end. The result was smooth, shiny and light hair with a silky feel. I went the whole day with perfectly non frizzed hair and even the 2nd day my hair looked frizz free! This serum does contain hydrolized wheat protein which can be dangerous if you are a celiac. Over the course of a couple weeks of using this magical serum I have noticed a dramatic improvement in the condition of my hair. I definitely recommend giving this a try!